House Speaker Paul Ryan, R-Wisc., spoke out Thursday against the separation of families at the U.S.-Mexico border while blaming the policy on recent court rulings rather than the Trump administration's actions, saying he’s not comfortable with the policy. "We don't want kids to be separated from their parents," he said at his weekly news conference. The House is expected to vote on two Republican immigration proposals next week that would limit legal immigration levels and deal with border security and the status of hundreds of thousands of young undocumented immigrants, known as Dreamers. One of those bills – a compromise measure GOP conservatives and moderates are still drafting – includes provision prohibiting the separation of children and parents at the border, according to a draft of the legislation obtained by ABC News. The bill, which also authorizes funding for a border wall and includes changes to the visa program and a pathway to legal status for young undocumented immigrants, clarifies the 1997 legal agreement known as the Flores settlement, which requires the government to release and not detain undocumented immigration children. In court rulings, the federal government has pointed to the settlement to justify the family separation policy. The new legislation, if signed into law, would require that accompanied alien minors apprehended at the border remain with parents or legal guardians while in custody of the Department of Homeland Security, according to a draft of the proposal. The White House has signaled support for the effort, though it's unclear if either measure has the support to clear the House, and whether they would be considered in the Senate. Protestors participate in a rally organized by Families Belong Together in Philadelphia,June 14, 2018. White House Press Secretary Sarah Sanders on Thursday defended the policy in response to questions from reporters. “It’s a moral policy to follow and enforce the law,” Sanders said. Attorney General Jeff Sessions defended the policy on Thursday by citing the Bible. “Illegal entry into the United States is a crime — as it should be and must be if you’re going to have a legal system whatsoever,” he said. Ryan said Thursday that the policy was the result of a court ruling – a reference to the Flores settlement – rather than a change in administration policy under President Trump. But House Minority Leader Nancy Pelosi, D-Calif., pushed back on that assessment, and said Attorney General Jeff Sessions and the Justice Department could quickly reverse the "barbaric" policy. "It can be changed just like that," she said, snapping her fingers. The family separation is a result of the “zero tolerance” policy enacted by the Justice Department to deter illegal border crossings, by prosecuting more immigrants for illegal entry. 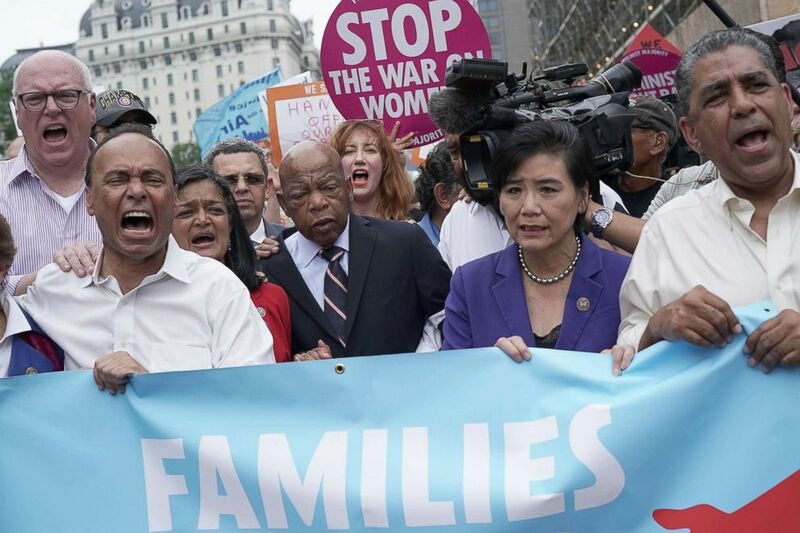 U.S. Rep. Joseph Crowley, Rep. Luis Gutierrez, Rep. Pramila Jayapal, Rep. John Lewis and Rep. Judy Chu march to the headquarters of U.S. Customs and Border Protection during a protest, June 13, 2018, in Washington, DC. "If you don't want your child separated," Sessions said last month, "then don't bring them across the border illegally. It's not our fault someone does that." Last week a federal judge in California ruled that a lawsuit challenging the administration's practice brought by the American Civil Liberties Union (ACLU) could proceed. The lawsuit alleges that the administration is forcibly separating asylum-seekers from their children upon arrival. 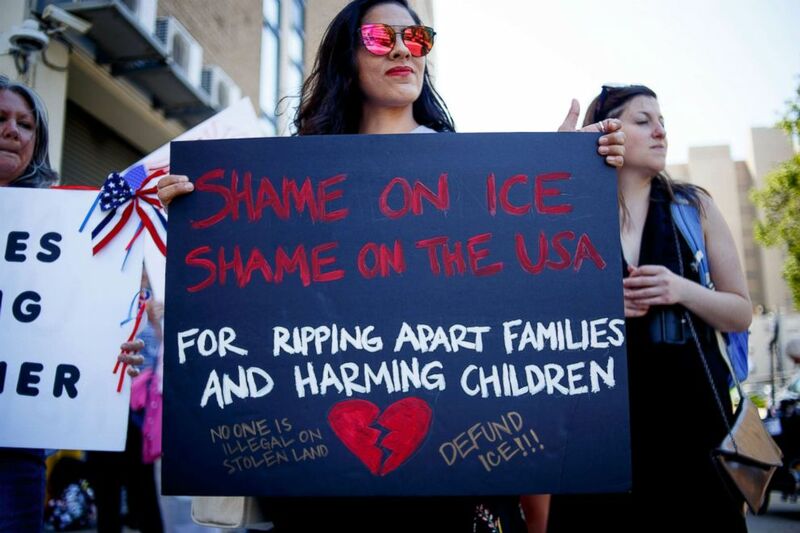 U.S. Immigration and Customs Enforcement argued in court filings that separating migrant parents and children in immigration detention "serve the legitimate purpose of allowing the government to carry out its immigration and criminal enforcement role" and that "plaintiffs have not provided any basis to conclude that there is a due process right to family unity that prohibited the separation." ABC's Lauren Pearle contributed to this report.